Every once in a while, an effect pedal so different comes along that it makes people teeter on the verge of complete flexistential breakdown. 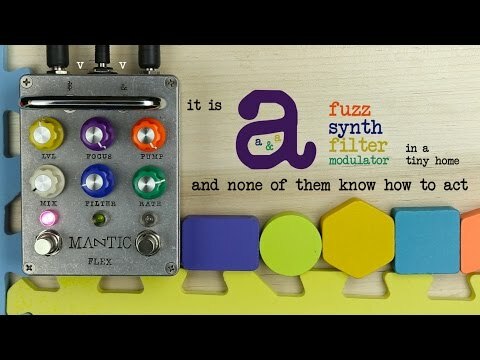 The Mantic Flex Pro is one of those effects. The ghost in this groundbreaking machine delivers a sonic palette so unique and inspiring, you'll think it came from the Anunnaki themselves. Glitched out pitch-mod growls with cerebrum piercing sqwuelches, angry-duck-funk quack, and gargling stutters are all just at the surface of the Flex's sonic potential. With an added Mix control, Filter range selector, and variable speed LFO for tracking modulation, the Mantic Flex Pro shreds expectations like a phone book. If you're ready to hear the future then the Flex Pro is for you! Notable users include Nick Reinhardt, Adrian Belew, Dominic Davis, Justin Meldal-Johnson, Simon Francis, Ikey Owens, and Juan Alderete!